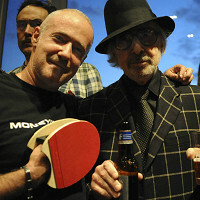 The ever-present fixture of the rec room, the game of table tennis, is about to get a new look. It's ping-pong with a twist. Fredi Brodmann got a handle on the situation by, well, just doing away with the handle entirely. He created a paddle with a double-sided grip that can be worn like a glove. Obsessed by table tennis as a young man, Fredi uncovered some interesting stats- over 25 million people play table tennis and there are over 8,000 professional Table Tennis Players. Not only that, but there have been few improvements to the game in years. Ergonomically designed for comfort, speed and precision, the newly minted paddle/blade is easy to get a grip on and lots of fun to use. 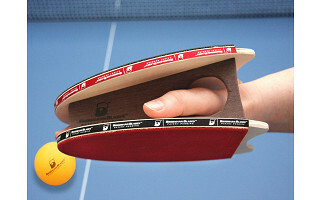 Brodmann's Blades have been cited by the Table Tennis Federation as the greatest innovation in the game in 100 years. Wear your paddle and score big. Game anyone? The ever-present fixture of the rec room, the game of table tennis, is about to get a new look. It's ping-pong with a twist. Fredi Brodmann got a handle on the situation by, well, just doing away with the handle entirely. He created a paddle with a double-sided grip that can be worn like a glove. Obsessed by table tennis as a young man, Fredi uncovered some interesting stats- over 25 million people play table tennis and there are over 8,000 professional Table Tennis Players. Not only that, but there have been few improvements to the game in years. Ergonomically designed for comfort, speed and precision, the newly minted paddle/blade is easy to get a grip on and lots of fun to use. 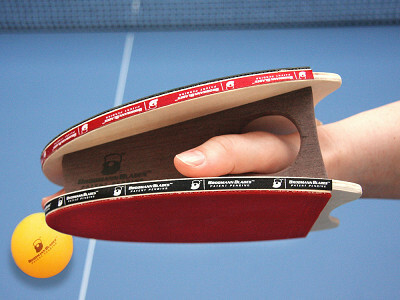 Brodmann's Blades have been cited by the Table Tennis Federation as the greatest innovation in the game in 100 years.